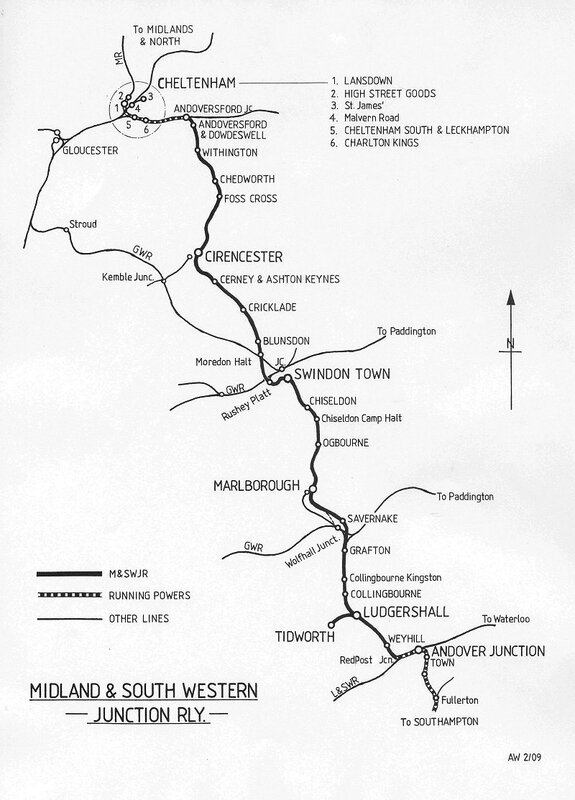 This web site details, in pictures and words, the Midland and South Western Junction Railway. Originally, my focus was on the stretch from Chiseldon through Swindon Old Town to Cricklade. As you will see, this has developed and the web site now covers the whole line. The next phase will be to add more period pictures, expanded commentary, photographs of original documents and many other items. The background work on the next phase is underway. I hope you enjoy the journey throughout 2019. A great book published in December 2004 on the Banbury to Cheltenham Direct Railway by Bob Brown, Neil Parkhouse and Stanley Jenkins. Click here for details. For details about a new book written by Rosa Matheson, published on 13th July 2006, about Swindon's 'Trip' click here. New book published 2nd November 2006 majoring on the M&SWJR. Click here for details. New book entitled 'Swindon Engineman' containing information on the M&SWJR published December 2006. Click here for details. Very interesting new M&SWJR book published May 2007. Click here for details. Excellent new book by Roger Day entitled 'Savernake at War' published in June 2007. Click here for details and Roger's booksigning in Marlborough. Pictures, courtesy of Chris Walker, of his 45 feet Swindon Town Station 'O' gauge layout added 13th August 2007. Click here to view the layout. Superb new book launched at 'Steam' on 15th September 2007. Click here for pictures of the event and details. Andover to Ludgershall in 2006 in eBook form by Nigel Alexander added 12th December 2007. A small selection of pictures from Nigel's superb eBook can be viewed by clicking here. With petrol and diesel now over £1 a litre steam makes a comeback.......! M&SWJR Working Timetable from 1901 courtesy of Tom Smith added 9th March 2008. Click here to view. A Swindon Town station staff photograph taken c.1920, added 26th April 2008, can be viewed by clicking here. The picture has a 6Mb file size so the M&SWJR detailing can be seen. Superb scratchbuilt 7mm scale model of No. 1121 as rebuilt by the GW in 1924 by Peter Brookbanks can be viewed by clicking here. Grafton visits Leatherhead in Surrey! Click here to see the 2008 outing of this excellent layout at Scaleforum on 27th September. Swindon & Cricklade Railway's inaugural meeting to build M&SWJR locomotive No.16, 31st January 2009. Click here to view the event. Pictures and video of the sale of a M&SWJR whistle and a M&SWJR closure notice at the Talisman Railwayana Auction on 7th May 2011, added 14th May 2011. Click here to view them. 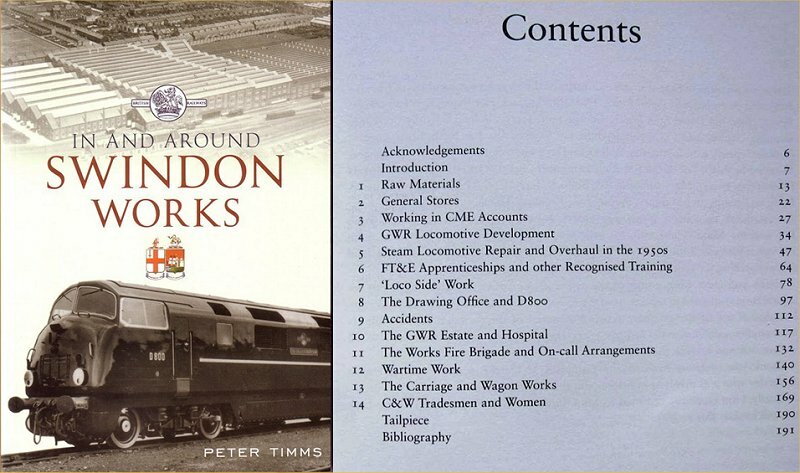 Click here to see details of Peter Timms excellent completely revised and enlarged book 'In And Around Swindon Works' originally published in June 2009 and now available in bookshops. The book can also be obtained by contacting Peter direct at peter.timms@yahoo.co.uk. Ludgershall running in board and sundry other items added 9th June 2012. Click here to view them. Click here, here and here to watch three clips of video recently found on the internet showing the destruction of the Moredon Power Station chimney, destruction of the Moredon Power Station cooling tower and an interview with Ted Windridge and Tony Penny at Swindon Old Town station all taken in the late 1970's. The Harry Collection, added 16th September 2012, can be viewed by clicking here. Click here to view Swindon Town to Broome Manor, added 7th October 2012, courtesy Pat Bartholomew. Bonus images: Closure and dismantling of the Swindon GWR Works courtesy of Jason McCormick, added 25th October 2012, can be viewed here. Click here to view Swindon Junction to Swindon Town, courtesy AVP Studios, added 27th October 2012. Please note, as this YouTube clip can't be played in this frame click on the link that will appear and which states 'Open this content in a new window' to view the clip. A selection of images courtesy of the David Bartholomew collection, added 4th November 2012, can be viewed here. A selection of pictures courtesy of the late Paul Strong, added 30th December 2012, can be viewed here. A selection of images to welcome in 2013, the 140th anniversary of the Swindon, Marlbrough and Andover (SMA) Railway Act of 1873 can be viewed here. The other Ludgershall running in board pieces found and added 14th January 2013. Click here and scroll half way down to find it. Click here to see the exhibition and superb 50 minute documentary (170Mb) on the M&SWJR around Collingbourne, courtesy of Claire Stevens, added 14th April 2013. Click here to view a trip down the M&SWJR from Cheltenham Malvern Road to Swindon Rushey Platt, courtesy of Huntley Film Archives, added 27th April 2013. It's not the best clip due to its darkness and the Huntley watermark, which will remain even if you elect to spend £36 for a personal dvd version from them. Please note, the MSWJR element starts from 2 minutes into the 4 minute clip and as this YouTube video can't be played in this frame click on the link that will appear and which states 'Open this content in a new window' to view it. ...and here's a ticket from the journey, courtesy Mike Barnsley. Click here to view a video of Rushey Platt farm (now a housing estate) in 1945 with the houses on Okus Road viewable above the horse's neck on the hill at one point, the M&SWJR Rushey Platt embankment, the canal bridge above the playing dogs and a GWR 2-8-0 goods which passes by on its way towards Cheltenham. Video courtesy of Derek Copson, who is also one of the stars in this family video, which was added 11th May 2013. Click here to view a video of Leckhampton station, Andoversford signal box and elements of the line from Cheltenham St James to Andoversford from the 1950's taken by British Transport Films, added 27th December 2013. Please note, as this YouTube video can't be played in this frame click on the link that will appear and which states 'Open this content in a new window' to view it. Click here to view a selection of M&SWJR images added 27th December 2013. For the last working timetable containing standard passenger journeys along the M&SWJR for the period to 10th September 1961 click here. Images added 1st January 2014. Added 12th April 2014, click here to view a selected list of magazine articles kindly provided by Phil Bond. A fabulous MSWJR 3-plank dropside wagon modelled by Mikkel Funder, added 30th May 2014, can be viewed by clicking here. Added 22nd June 2014, click here to view a selection of pictures of a superb 5 inch gauge wagon and loco by Garry Owen. Excellent new book on Swindon Works by Andy Binks and Peter Timms out now. Click here for details. 'My first job at the Andover Junction Shed', a wonderful 1950's first hand account by Tony Mason added 28th June 2015 can be viewed here. Superb scratchbuilt 7mm scale model of Sharp Stewart 4-4-4T rebuilt by the GW in 1925 and numbered 27 by Peter Brookbanks can be viewed by clicking here. A further selection of images linked to the line, added 17th January 2016, can be viewed by clicking here. Click here to view pictures taken by Gordon Bond at Rushey Platt, courtesy of Mike Bendrey, added 29th October 2016. Click here to learn more about a superb book on Swindon Works by Andy Binks and Peter Timms. Click here to view Molly ex-works, courtesy of John Hutchings and Nigel Attwood. Click here to view details of a excellent book on the M&SWJR launched at Steam in Swindon on 9th September 2017. Click here to view details of another excellent book on the M&SWJR launched at Southampton Model Railway Exhibition in Eastleigh on 27th January 2018. 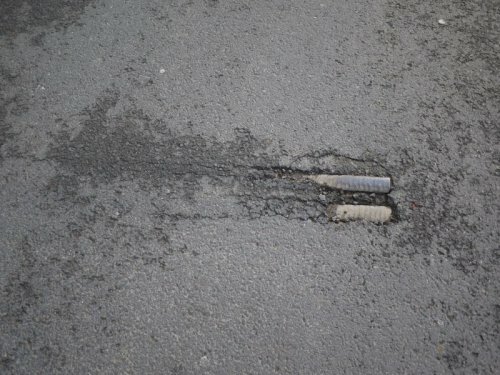 Track breaks the Sandy Lane, Charlton Kings, Cheltenham road surface in 2018. Pictures courtesy of Malcolm Clark. 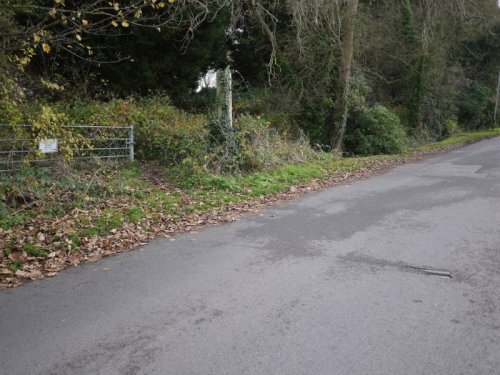 Click here to view the same location in 2013. 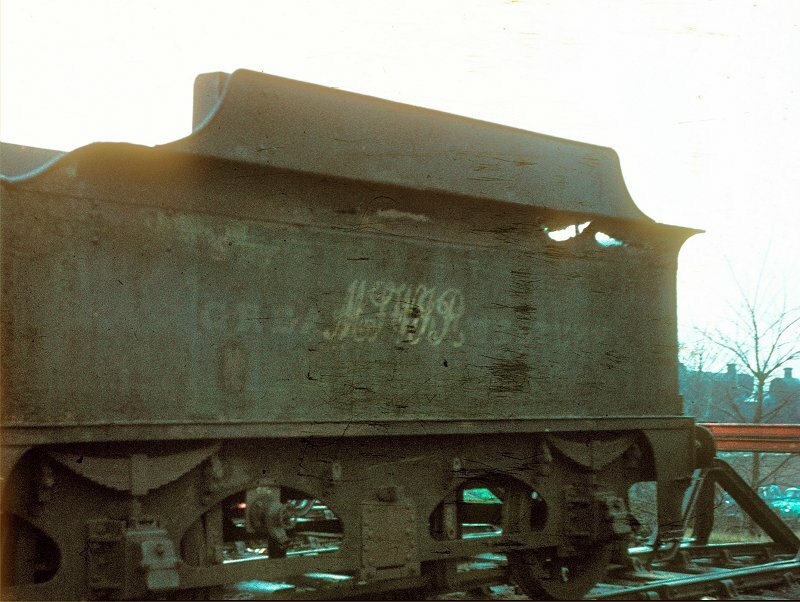 MSWJR tender taken at Reading motive power depot on 5th December 1964 courtesy and copyright Richard Bairstow. 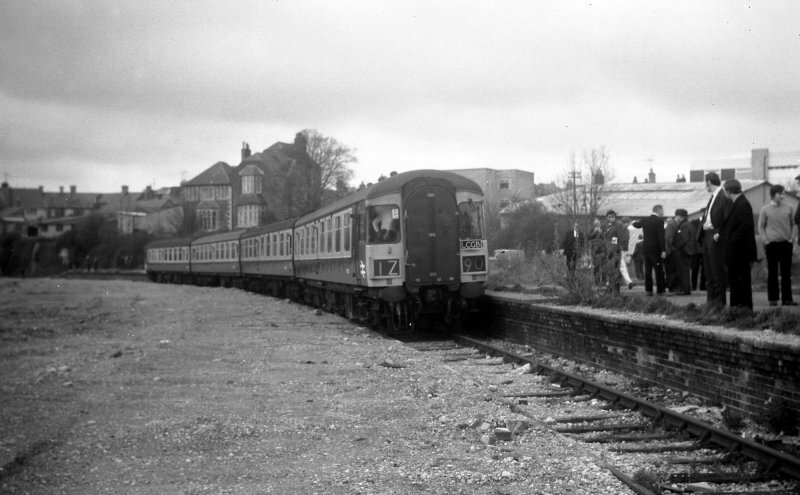 The last passenger train into Swindon Town station, 1972. Please feel free to send me an e-mail by clicking here and typing a note. These messages will not appear in the guestbook, which I set up on 2nd October 2006 to allow visitors to share memories, knowledge or post questions about this line (see top of the left navigation bar).